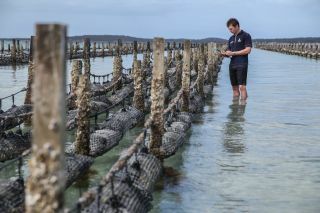 South Australia ensures the ecological and sustainable development of its fisheries and aquaculture through its globally recognised robust policy and legislative frameworks. Some of the world’s most sought after seafood are found in the State's waters including rock lobster, tuna, abalone, oysters and prawns. Around 70,000 tonnes of seafood were produced in 2017-18, generating revenue of $515 million. The Seafood key messages and fast facts (PDF 227.5 KB) provides comprehensive messaging, including fast facts, about the seafood industry to help gain an understanding of it in South Australia, including production and farm gate value.